Upon becoming governor, Judy Martz’ first legislative session resulted in the single largest increase in the education budget in Montana history, as well as tax cuts intended to stimulate the stagnant state economy. Martz was put under a statewide microscope in November 2001 when a 1999 real estate deal between the Martzes and ARCO was uncovered. The Martz family had a ranch that adjoined another large parcel of land that was owned by the ARCO company, at that time ARCO sold that land at an allegedly low value to the Martz family. The state Democratic Party alleged that Martz had assisted ARCO in her position as Lieutenant Governor. However, the Montana Commissioner of Political Practices found that the allegations lacked merit. Also during her term, her chief policy adviser, Shane Hedges, was involved in a drunk driving accident near Marysville, Montana, in August 2001, after which he went to Martz’s residence, where she washed his clothes. House Majority Leader Paul Sliter died in the accident. Martz’s policy advisor promptly resigned and pled guilty to a charge of negligent homicide. 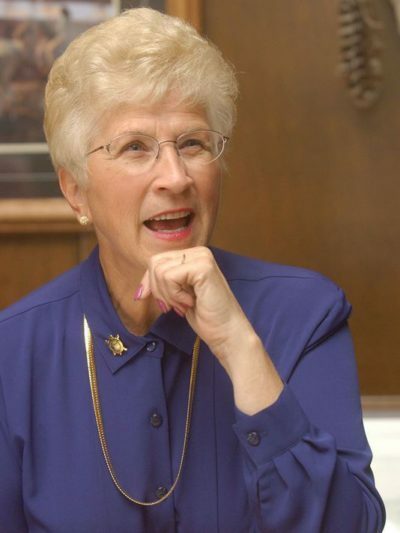 Judy Martz announced that she would not run for re-election as governor in 2004. Martz finished her time in office campaigning for President Bush in Ohio, Arizona, and other swing states, and sparring with incoming Democratic governor Brian Schweitzer over transition of state government. In September 2005 Judy Martz was named chair of Montanans for Judge Roberts (Chief Justice nominee John Roberts) and spoke at a rally in support of Roberts. She also sat on the boards of Maternal Life International, University of Montana Western, Big Sky State Games, and TASER International, a company that manufacturers non-lethal electrical shock equipment for law enforcement, the military, and private individuals. She never ruled out another run for office, saying she would have to pray “long and hard” to make the decision. On November 11, 2014, it was announced that Judy Martz had stage II pancreatic cancer and was undergoing treatment in Arizona. She died of the disease on October 30, 2017, in Butte, Montana, at the age of 74.